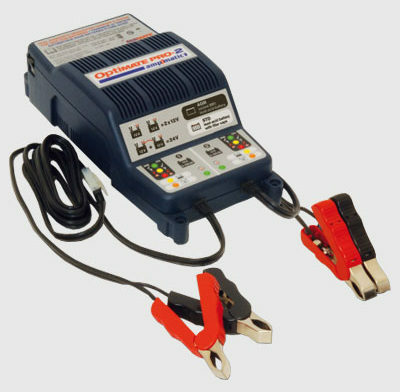 This shop charger has two independent charging systems of 2Amps that are able to desulfate, charge, maintain & initialize new batteries using the 12 hour program. Simply connect a battery and the rest is automatic. 2 x 12V OR 1 x24V system. SKU: TS-180 Category: Workshop Battery Chargers Brands: Optimate. 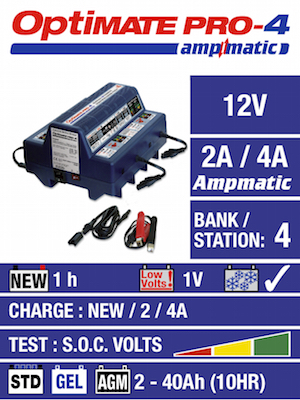 Use the Optimate Pro 2 to Charge & Recover 2 x 12V batteries at a time ! 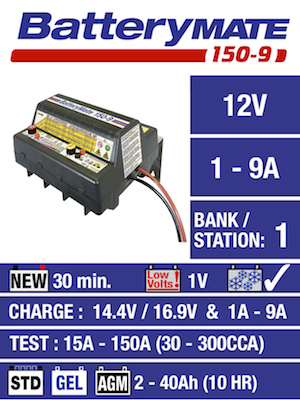 Use on 2 x 12V lead-acid batteries independently OR connected together in a 24V system. Simply connect a battery and the rest is automatic. 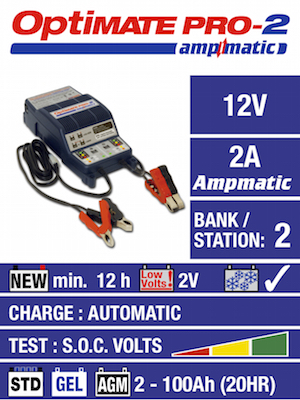 Includes the new AMPMATIC program that automatically controls current and enables cell equalization for initialization of new batteries over 12 hours. Tests and verifies charge retention by battery. The high voltage & pulsing recovery mode is able to save a neglected *sulfated 12V lead-acid battery unable to accept charge from a standard charger. Automatic safety features include quick identification of a severely shorted battery, 12 hour maximum program for USED batteries and electronic reverse polarity protection. Wallmounts are included for easy & convenient wall placement and the unit comes with both battery clips & permanent connectors for both banks with cable reach of over 8ft / 2,5m. Both banks use the 12 hour program outlined below. MAX charging time is 12 hours with the program moving to maintenance if left connected. 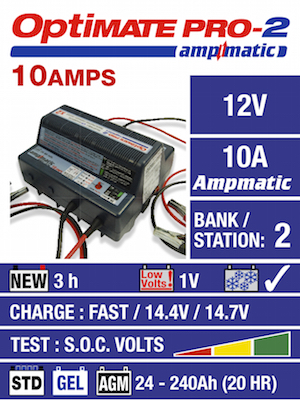 Battery impedance dynamically changes as charge is delivered to the battery. 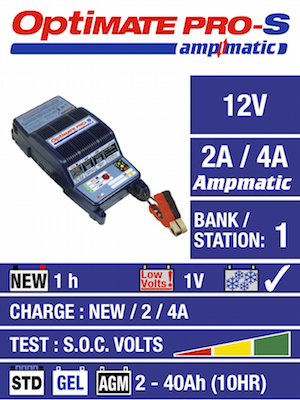 The Ampmatic program varies current according to battery impedance to bring the battery to full charge as quick as possible. The MAX current setting limits total charge into the battery in case an aged or neglected battery has suffered electro-mechanical damage that significantly altered battery impedance. A fixed low current (200mA ) is injected into the battery to determine battery impedance / charge acceptance. If there is abnormally high impedance typical of a sulfated battery – high voltage recovery mode is engaged. A voltage of up to 22V is delivered to force current into the battery and as the battery recovers the voltage will automatically reduce. MAX recovery period = 2 hours. Pulsed recovery mode engages once the battery’s charge acceptance has significantly increased. Current is delivered in pulses and voltage is cycled up to 14,3V. Current is increased as the battery’s charge acceptance improves. Pulsed recovery period is 15 minutes, after which program moves to BULK charge mode. voltage has risen to 14,3V. Absorption & cell equalization mode – for 10 minutes the voltage cycles between 13,6V & 14,3V as the Ampmatic program varies the current. This cyclic action effectively rebalances used battery cells whilst remaining below the natural gassing level of the acid mixture, ensuring that no pressure build up occurs in sealed batteries and overflow in standard filler cap batteries is eliminated (if the battery was not overfilled prior to charging). If during the 5 minute verification mode the current demand from the battery remains high charging returns to absorption / equalization mode. Test period: Initial test: 30 minutes – Extended ‘cool down’ test: 12 hours. Charging is suspended and the voltage is monitored. If only the green LED (voltage above 12,7V) is flashing after 30 minutes the test is extended to 12 hours. The extended test will expose suspect batteries that may seem to hold charge (following recovery), but lose power due to irreversible internal damage once the temperature lowers down to normal levels. AGM batteries are expected to remain above 12,7V (green LED). STD batteries are expected to remain above 12,6V (green / yellow LED).